How do I sign up for an artist account? Once you have registered an account, click the “Seller Area” link in your profile dropdown menu. This will open the seller application form. Please fill in all the fields on the form and submit it. We will review your details and portfolio and get back to you with a decision as soon as possible. How do I upload my artwork for sale? 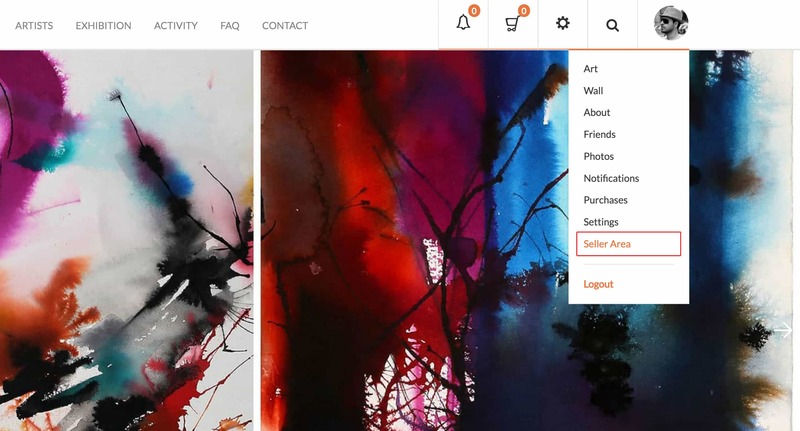 Once your account has been approved, you can upload your art for sale by going to the Seller Area by clicking the “Seller Area” link in your profile dropdown menu (above logout). Can anyone join the website? Yes! anyone can join Gallery 6 as a member and network with artists, galleries and buyers on the platform. Can anyone sell art on the website? Anyone can apply to sell, but only selected artists whose work meets our quality guidelines and standards are allowed to sell their work on the platform. What can I sell on Gallery 6? We currently only accept drawings, paintings and prints to be listed on the website for sale. Sculptures, installations and other 3D work are not allowed to be listed for sale, although they can be posted on your wall or photo albums. We charge a flat percentage commission on the sale price of your artwork (excluding shipping). There are no costs to you other than this. This ensures that we succeed when our artists succeed. Our commission rate is comparable to the commission rate of art galleries across Pakistan. If you are unsure of what this is, kindly call us on +92512825738. You will be paid your share on all sales of your work directly into your bank account in the first week of every month. Who will deliver my sold work? Can artists outside of Pakistan sell their work? No, unfortunately artists based outside of Pakistan cannot sell their work on the platform. But they are more than welcome to join as a member and use all other features of the site. Can I sell my art at other places at the same time? Yes, you can offer your art for sale anywhere else at the same time, provided it is not sold at a lower price. Please update the status of the work on Gallery 6 if it becomes unavailable or is sold elsewhere to avoid dissatisfying buyers. Which currency should I price my artwork in? Please list all your artwork in US Dollars. This is the currency that is supported by our payments processor. Should I be selective about the artwork I upload? Yes, you should only upload your strongest work to increase the overall strength of your portfolio.